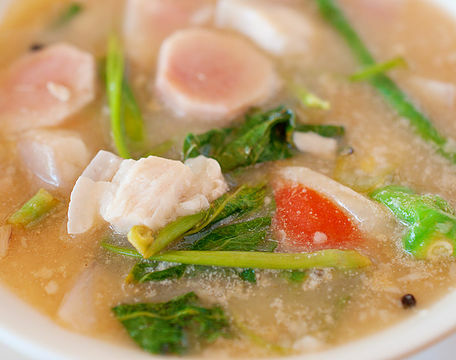 Are you craving some Filipino food? 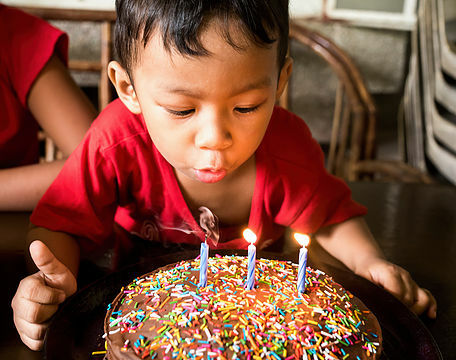 Try some of our most popular dishes and bring a taste of the little children's home and the Philippines into your home! Sauté garlic in oil. Add chicken and continue sauteing until cooked. Pour soy sauce, water, vinegar, bay leaves, sugar, and pepper. Bring to boil and simmer for 10 minutes. Turn off flame. Drain the meat and fry. Bring back the fried meat in sauce. Reheat and simmer until sauce thickens. Serve with rice. Place meat in pot, add enough water to cover it. Bring to a boil and remove scum. Add onion, tomatoes and fish sauce. Lower heat and cover pan. Let simmer for about one hour or until meat is tender. Add water as necessary to maintain about 10 cups. And taro and cook for about 6-8 minutes. Add radish, long beans, water spinach, and okra, and cook for another 2-4 minutes. Add tamarind base and stir until completely dissolved. Season with salt and pepper, and serve with steamed rice. Heat oil in a cooking pot. Saute the garlic and onion until the onion becomes soft. Add shrimp. Cook for 1 to 2 minutes. Remove shrimp from pot and set aside. Meanwhile, pour-in the coconut milk. Stir and let boil. Add squash. Cook for 8 to 12 minutes or until tender.Put the shrimp back in the pot. 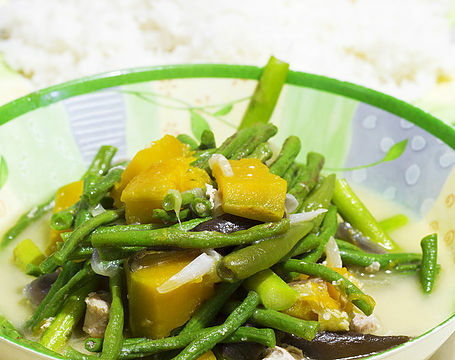 Stir and cook for a minute.Add the string beans (sitaw) and malunggay leaves. Cook for 2 to 3 minutes. Season with salt and pepper. Another variation of Ginataan (cooked in coconut milk) is Ginataang Tilapia with tilapia, chili peppers and pechay instead of shrimp and vegetables. Sauté garlic and onion. Add pork and chicken, and let cook for 2 minutes. Add chicken cube and water, and simmer for 15 minutes. 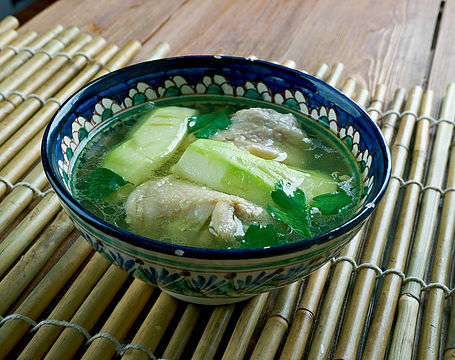 Add carrots, pea pods, cabbage, and celery leaves and simmer for a few minutes. Remove all the ingredients in the pot except for the liquid and set them aside. Add soy sauce and mix well. 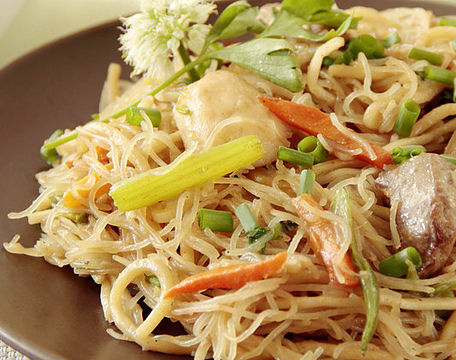 Add rice noodles (make sure to soak them in water for about 10 minutes first). Cook until liquid evaporates completely. Add vegetables and meat that were previously cooked and simmer for a minute or two. Sauté garlic, onion and ginger. Add chicken and cook until color turns light brown. Add fish sauce and mix well. Add water and put to boil. Simmer for 45 minutes. Add green papaya wedges and hot pepper leaves. Season with salt and pepper and serve with rice. Heat oil in deep cooking pot. Once the oil becomes hot, sauté onion and add pepper. Cook for 20 seconds, then add meat. Cook until color turns light brown (about 3 to 5 minutes). Bring to boil. 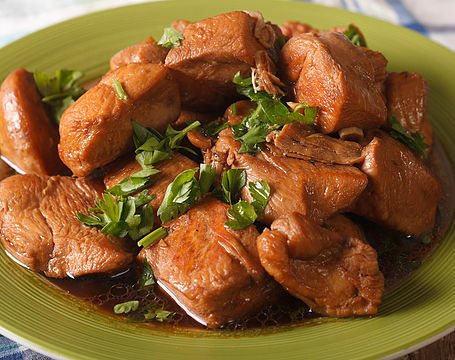 Simmer for 45 to 60 minutes or until the pork becomes tender. Add saba banana and potatoes. Stir and cook for 12 minutes. Add cabbage and season with salt. Cover and continue to cook for 3 minutes. Transfer to a serving bowl. Bring 4 cups of water to boil. Add tapioca pearls and cook for 40 minutes on medium heat. Add ¼ cup brown sugar and mix well. Turn off the heat and let sago pearls sit in the cooking pot until room temperature is achieved. Set aside. Boil 1/2 cup of water and add 1 cup of brown sugar. Mix well and simmer until the mixture becomes thick. Set aside. Pour tofu in a glass or mug then heat in a microwave oven for a minute. Top with cooked sago pearls and brown sugar syrup. Serve warm. Taho is a Filipino snack and street food. Often the magtataho - the taho vendor - stops at the little children's home, and our children have taho as their morning snack. Separate eggs. Beat egg yolks and sugar until mixture is creamy. Add water and oil and mix well. Combine flour and baking powder and stir in gently. Beat egg whites in separate bowl until stiff and fold in. Divide the batter into two equal parts. To one part add cocoa powder, keep the other part plain. Pour two tbsp of white batter in the center of greased baking tin. Then pour two tbsp of cocoa batter on top of white batter in the center. Do not disturb or try to shake it, it will spread by itself. Keep pouring alternatively until no cake batter is left. This will create a zebra pattern. Cover with chocolate frosting (or melt chocolate over cake) and decorate with sprinkles.